In Lisa Reihana: Emissaries, the artist dissects and challenges the imperialist gaze through alternative storytelling, re-characterisation and reclaimed historical narratives. The exhibition’s main attraction is Reihana’s vast panoramic video in Pursuit of Venus [infected], 2015-17, which is a cinematic reclaiming of the Neoclassical French scenic wallpaper Les Sauvages De La Mer Pacifique, 1804-1805, also known as ‘Captain Cook’s voyages’. Reihana’s plays between fact/ fiction with her animated, rolling film showing snippets of Pacific life including cultural ceremonies, performers and encounters between the Pacific natives and the invading white explorers. What is most notable in the original wallpaper is the whitewashing of the Pacific Islanders but also the lack of violence depicted, perhaps an attempt to gloss over the violence inflicted on the islanders which included burning their towns and sinking canoes over minor perceived offences. 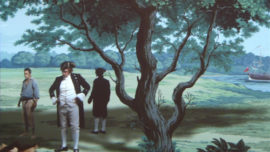 There is an interesting parallel between Reihana and the commissioner of the original tapestry, Joseph Dufour who utilized previously unheard of printing techniques to produce the twenty panel scenic wallpaper which reflected the public obsession with the voyages of Captain Cook in popular culture. Two centuries later, Reihana uses advanced visual technology to re-appropriate the original European depiction in a way that embraces a more culturally sensitive narrative.